What Eggs-actly Is Egg Tempera? 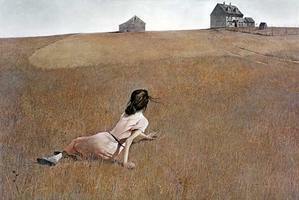 1 Caption: Andrew Wyeth's egg tempera painting "Christina's World." Painted in 1948 and later purchased by the Museum of Modern Art, this is one of the most recognized paintings in American art. 2 Eggs are an ingredient in lots of recipes, from tasty birthday cakes to fragrant egg rolls. Did you know that eggs are also an ingredient in one type of paint? Egg tempera is a kind of paint that has been used for centuries. Today, the term "tempera" sometimes refers to a different type of paint called poster paint, but this kind of paint is not related to egg tempera. So what eggs-actly is egg tempera paint? 3 Many European artists used egg tempera paint during the Middle Ages and even before that. They made their own paint. They hand-ground dry powdered pigments into egg yolk. The egg yolk acted as a binding agent. It made the pigment particles stick together. The yolk also made the finished paint stick to a surface. Sometimes, artists added other things to the paint, such as honey, water, and casein, a part of milk. They also added different plant gums. The result was a durable, quick-drying paint. Feedback on What Eggs-actly Is Egg Tempera?